Gui Xianggu was one of the many artists who rose to prominence in the wake of Zhou Leyuan and, like so many of them, he seems to have begun by copying Zhou’s works. Since Gui used his own signature first in 1893 and must have known of Ye Zhongsan and Zhou Leyuan early in his career, and since the style here is obviously very tentative and experimental, it may actually be a correct date. Whatever name Gui used in these early bottles with false signatures, he never made any attempt to hide his own evolving style, which became very distinctive, or his own palette which was unique among the inside-painted artists, with its dominant use of a pale purple colour in most of his works. Although unquestionably a commercial artist, he is one of the most intriguing. He was also capable of excellent work when he put his mind to it, as is demonstrated by the few bottles in this collection and many more on record. Gui worked under his own signature from 1893 to 1901, and we have 60 recorded works from him, if we include the two with spurious signatures. Most of his bottles were dated, and he seems to have been particularly productive in the years 1899 and 1900. He borrowed subject matter freely from a range of artists, but he was a very individualistic artist with a strong style of his own, who also introduced a number of fresh subjects to the genre. It is also clear that, when borrowing from others, he was usually very creative in rethinking the work of art. 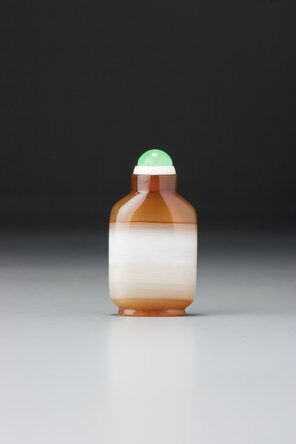 The present bottle is an excellent example of this, where a subject borrowed, we may assume, from Ma Shaoxuan (who painted it first in 1894) is linked to its origins only by the subject on one side, and by the long inscription on the other in a style referring to Ma’s output. What is more, Gui varied his different versions of this subject, of which there are several, quite considerably. Unlike with Ma, no two are ever the same composition, and clearly Gui was an artist who liked to re-invent each subject as he painted it, another factor that makes him one of the most intriguing of the artists from this period. For the subject of the Qiao sisters, see Sale 4, lot 40. The inscription has the irregular line length of a lyric (ci) or aria (qu), but it ends in a long line that rhymes with nothing, which would be impossible in any form of traditional poetry in China. It is possible that Gui Xianggu broke off the inscription before the end of whatever composition he was copying; this happens fairly regularly on snuff bottles. But it may be his own work, for we have not found a source for it. The inscription does not refer to the Qiao sisters, although it does contain one allusion to an event involving the husband of the younger sister, General Zhou Yu, who was an expert in music. Even if Zhou Yu were seemingly paying no attention to the music at a banquet, if the musicians made a mistake, he picked it up and inevitably looked around at them. Whether the writer meant this to be an allusion to Zhou Yu specifically or used the reference to ‘turning around to look at the tune’ in its general meaning of ‘musical appreciation’ is unclear. The composition sees in the corn poppy certain famous events around the founding of the Han dynasty, hundreds of years before the Qiao sisters lived. Xiang Yu, who had toppled the Qin dynasty but failed to establish a stable and defensible state in its place, was pursued to a place on the Yangzi River called Wujiang, where he found himself surrounded by an army led by Liu Bang, the eventual founder of the Han dynasty. He refused to cross to safety, lamenting that he could not face the families of the thousands of young men who had followed him and lost their lives. According to some accounts, he committed suicide there after making a last stand. Before the final battle, he sang a lament for his consort, Yu, who danced for him one last time. Her name, Yumeiren (the Beauty Yu), is also the name of the corn poppy, and the inscription turns on this fact. One more note: Chu in this context refers to the area from which Xiang Yu had raised his army and headed north toward the Qin capital, and it was known for its beautiful women and dances. This is one of Gui’s masterpieces and one of his finer bottles in general, since the unusually broad form and fat shape have allowed him more scope to be expansive, to which he has responded with the finest version of a subject he painted several times.